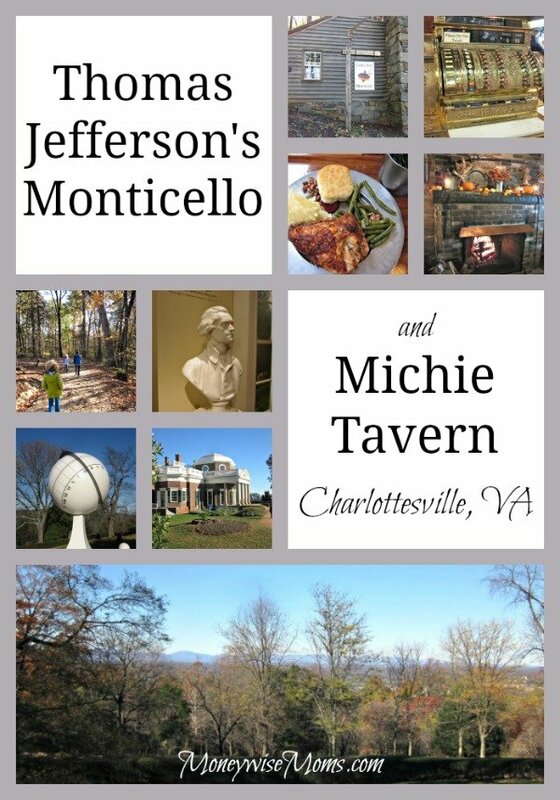 We took a pretty drive through the autumn leaves to Charlottesville, Virginia, home of Thomas Jefferson’s Monticello and the Michie Tavern. It’s a little over two hours from DC to Charlottesville, and you can make the trip longer (but much more interesting) by traveling on Skyline Drive through Shenandoah National Park. Monticello itself is located on a small mountain, so after you purchase tour tickets at the Visitors Center, you can take a quick shuttle ride to the top. Admission is $8/child for ages 5-11, year-round. Kids under 5 are free. Adults pay $18 between November and February, then $25 between March and October. The Thomas Jefferson Foundation participates in the Blue Star Museums program, which means that admission is FREE between Memorial Day and Labor Day for all military personnel and their families. Depending on the date of your visit, you may be able to take a Family Friendly Tour, meant for kids ages 5-11. This is included in the regular price of admission. We went after the end date of October 31st, and my big kids (ages 8, 8 and 11) did just fine with the regular tour. Before heading up for the tour, be sure and visit the Griffin Discovery Room, across from the Visitors Center. 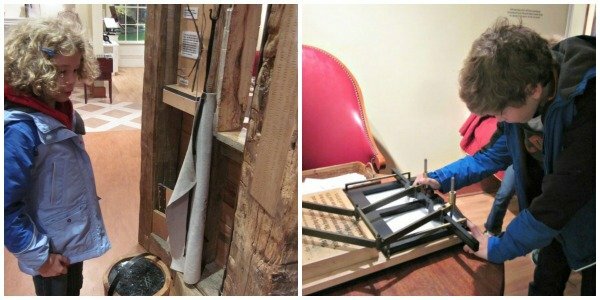 This lets the kids see many of Jefferson’s inventions before seeing them in the real house. In the Discovery Room, they can touch and try everything, and learn how they work. We learned about the Great Clock, turned the Revolving Bookstand, and tried the Polygraph letter-copying device. Once you’re in the home tour, you cannot touch anything (or take any photos, which is why I couldn’t show you the inside). My kids enjoyed getting a preview and learning a bit about Jefferson before we took the tour. My kids were excited to visit Monticello because they knew a bit about Thomas Jefferson from our visit to Independence Hall. They also made a lot of comparisons to what they had seen at Mount Vernon. 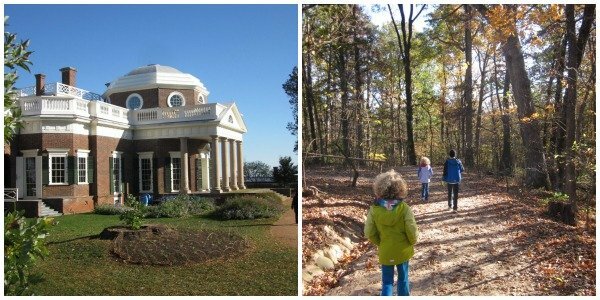 It’s generally recommended that the Monticello tour is for older kids; I think that elementary-age is the youngest that can follow along and enjoy themselves. From there, we drove about half a mile down the mountain to Michie Tavern, a restored historical site that served travelers more than 200 years ago. Inside, you’ll enjoy a buffet feast and hospitality from servers in period attire. My kids loved the southern cooking–fried chicken, mashed potatoes with gravy, biscuits and greens. It was all-you-can-eat, with adults at $17.50, youth (12-15) at $10.95, and kids (6-11) $6.95. Kids under 6 eat free with a paying adult. The restaurant is only open for lunch (11:30-3:00), but the grounds and tour are open all day. We did the self-guided tour, using the Kids’ Treasure Hunt we picked up in the gift shop. 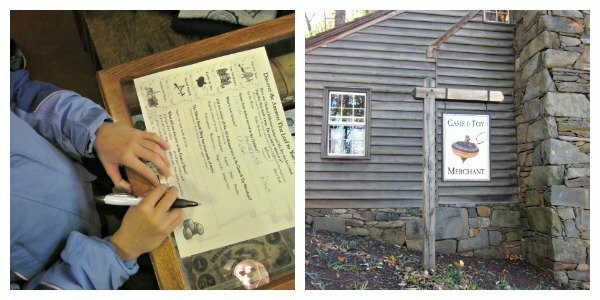 That took us to the Metal Smith Shop, The Game & Toy Merchant, and The General Store, where the kids followed clues and learned a bit of history. They were rewarded with gold (chocolate) coins at the end. They really enjoyed seeing the silver and pewter works, vintage and antique toys, and all the goodies in the general store. In the same area is Ash Lawn-Highland, the home of James Monroe, fifth President of the United States. We didn’t make it there, so it’s something to look forward to on our next visit to Charlottesville. While we thoroughly enjoyed the fall colors, it would be great to head back to Monticello when the gardens are in full bloom for a different view. 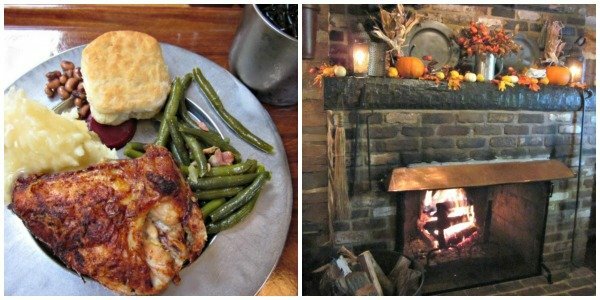 There are also numerous holiday events happening at both Monticello and Michie Tavern. Disclosure: I received tickets for the kids and I to tour Monticello. 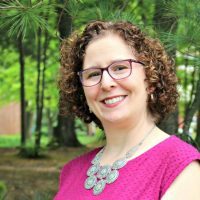 We paid for my husband and our meals at Michie Tavern. My opinions are my own. Thank you for sharing these pretty impressions of your trip. It seems they have a lot of interactive displays, which is always great, especially when you are visiting with children. We have not seen the place yet, but it looks beautiful. I love the shots of the building and surrounding area, very pretty. Thank you for sharing!